Today was a great day to take photos of this new trail along the towpath. 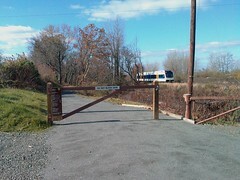 Currently the path is complete from Canal Blvd and Lamberton Rd down to the Crosswicks Creek. A bridge will be built soon, probably in 2009 which will connect the path to downtown Bordentown. Yeah I was checking this out from the RiverLINE last week and was wondering about the status. Funny as I was also down in Trenton with my bike today. I found Trenton's long lost bike lane and greenway along the Assunpink Creek! BTW John, could you cross post this on WalkBikeJersey too?